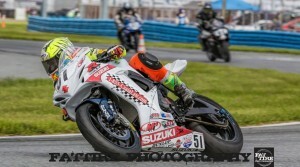 De Keyrel Racing lines up at Daytona aboard the 1-855-Czaia Law Machine! 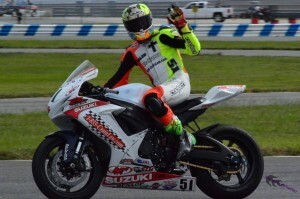 The weekend started out with riding two days at Daytona for the Team Hammer track day. I was one of the instructors, so I worked with multiple students throughout the day. It was a really fun experience being able to help people with their riding! Then we started to get into some racing! The first race was the team challenge and I got a great jump and was right up in there until 4 laps in when the motor blew. I was in an area on the track where you couldn’t cross back over to get to the pits, so basically I was stranded until the race was completed. The next day, I got up and was ready for a new beginning. I was feeling good in practice having to make lots of passes and that ended up leading to getting pinched out while trying to pass some slower riders. The front end just dropped and I was on my head. That crash lead to my pinky finger getting ground up a little bit. I got it cleaned out and got back on the line for the first race of the day! I made it one lap and the shifter was acting up and not shifting. So I had to pull off, because I didn’t want to get rear ended on the banking. The crew I was working with did a great job in getting the bike ready to go for the next race with zero issues. Now it was all on me. I got a good jump and was fighting from the back up to the front, but lost the tow from the leaders and would finish a lonely 4th. I was struggling starting from the back and missing the tow with the leaders on the first lap of the next race. I was 5th. 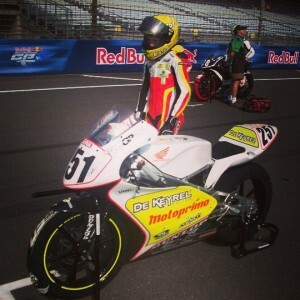 I then raced my 600cc bike against the 1000cc bikes and finished 7th, but was the first 600cc. We were making progress every time we hit the track, but starting from back was not helping. 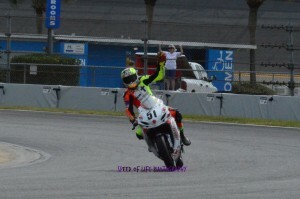 The next two races I finished 6th. We were getting the bike where it needed to be handling wise and working with the data guys I was able to see where I was slower. I was extremely happy getting that experience with data loggers and all the interesting stuff I don’t normally have as tools to getting better. I lined up for the final race of the day and gave it my all pushing up to the front and getting my best finish of the rough starting weekend. I have to give a huge thank you to CJ Czaia and John Ulrich for this opportunity! Also huge thank you to Lee my mechanic for the weekend. He did an awesome job alone with the whole crew! 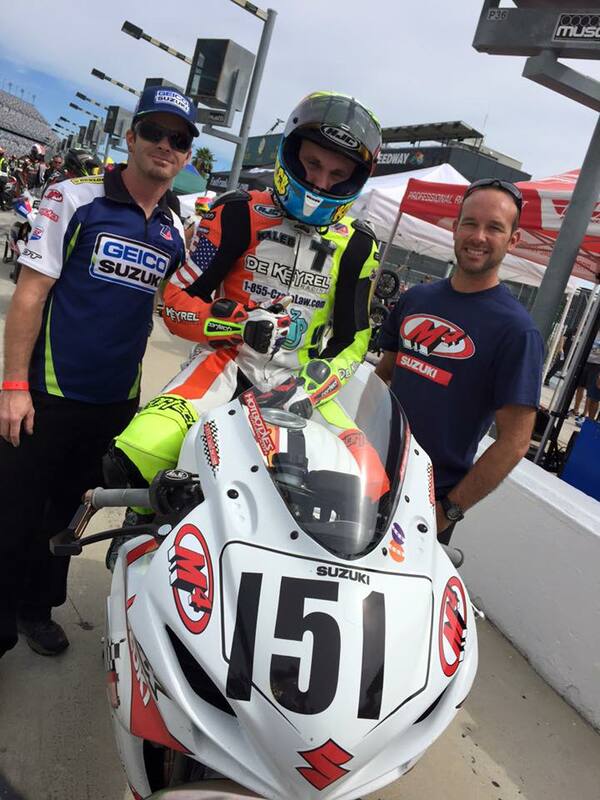 Overall I accomplished exactly what I needed to at Daytona, getting more experience with the track and how drafting can effect finishes. But most of all some great testing for the 200 in the near future! 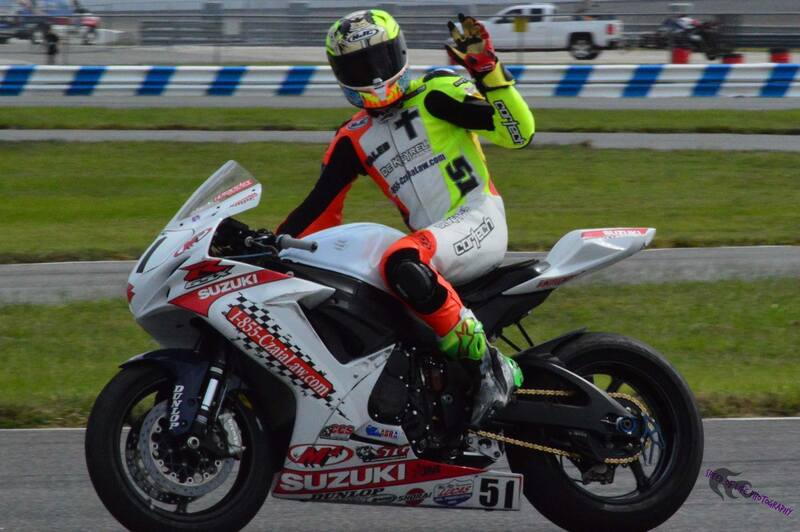 Posted in Uncategorized	| Comments Off on De Keyrel Racing lines up at Daytona aboard the 1-855-Czaia Law Machine! 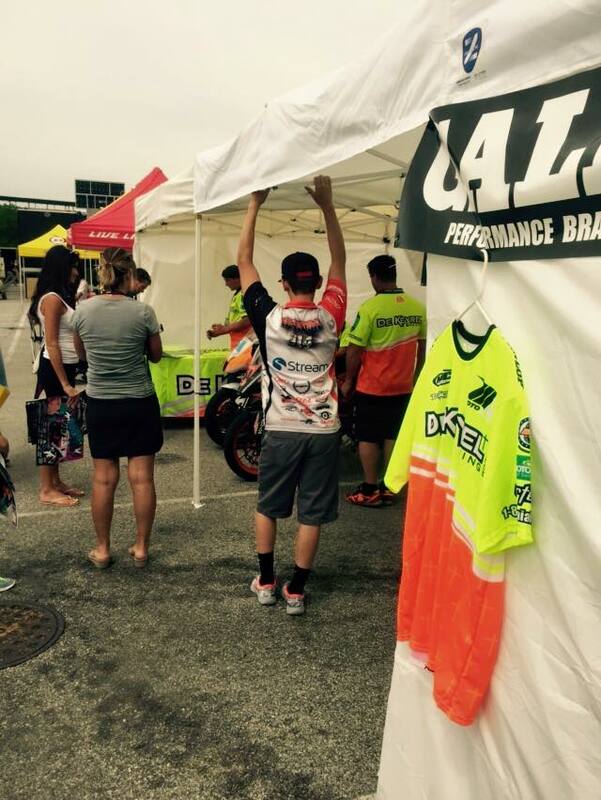 De Keyrel Racing Testing at National Dizzy and Balance Center! I was recently tested for concussions at the National Dizzy and Balance center. This test was not because I currently have a concussion. It was to simply get a base line so if in the future we think I have a concussion. National Dizzy & Balance center can retest me to know for sure. They would then compare the new data to a base line. This will allow them to more accurately know exactly where I am in the stage of being concussed. They will be able to diagnose faster and more accurately the level of concussion. This will allow me to get into therapy for the concussion with the accurate knowledge to get me back riding sooner. 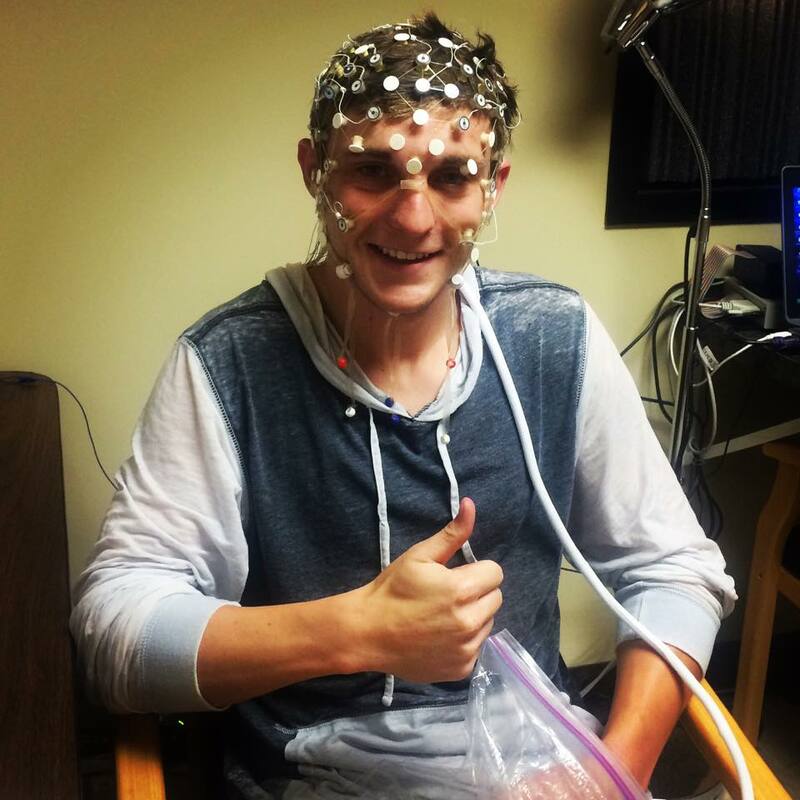 Doing this test will allow me in the unfortunate case of a concussion to get back on the track faster and safer! We did a couple of tests and not all were related to concussions. This test was all about balance. Not only how your body reacts in a fast reflex situation but the way it reacts. Some people put more weight on there toes because they don’t react with there hips which is more stable. We learned a ton about our bodies and how I react to certian situations. I have to give a huge thank you to National Dizzy and Balance center for testing us today. If you have not had this test done take it sooner than later because if you are concussed it’s too late to get a base line to compare too! Their focus is getting athletes back into competition safer sooner. National Dizzy and Balance Center (NDBC) is a unique outpatient clinic system. We combine Physicians, Audiologists, and Physical Therapists all within each facility to offer a true multidisciplinary approach to vertigo, dizziness, balance disorders, and concussions. This approach to patient care is what makes our clinics so unique. We also utilize state-of-the-art Diagnostic Balance Testing Labs to more accurately diagnose our patients when entering our programs here at NDBC. 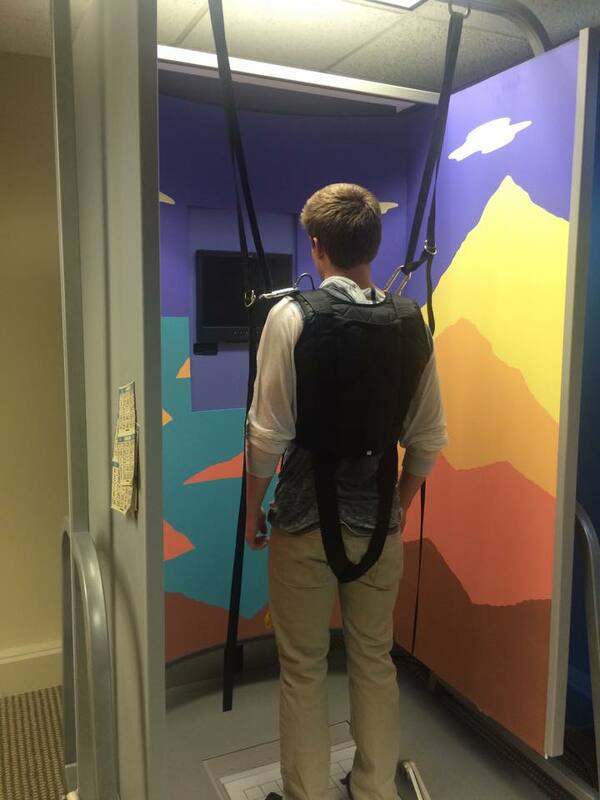 We utilize this data to develop individualized rehabilitation programs for each patient at NDBC. 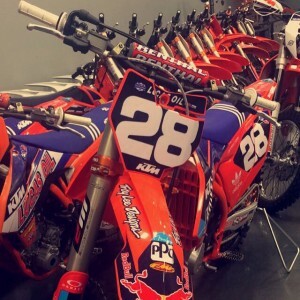 Posted in Uncategorized	| Comments Off on De Keyrel Racing Testing at National Dizzy and Balance Center! Sunday morning we headed to the Minneapolis airport to go to the American Super Camp in Fort Collins, Colorado. Once we got there we ate lunch and then checked into our hotel. After we did all that, we headed to the camp to get signed in. After Danny and the rest of the instructors got done talking and introducing themselves, we all got our gear on and went out for our first time on the track. They started out doing an oval to teach the body positioning and how they teach to ride. One of the main key things I learned while I was there was to use the rear brake more and to easily go on and off with it. Not just letting it release super fast, you have to release it real slow, so not upset the chassis. In this photo is a picture of one of the drills they did one hand on the gas cap and feet on the foot pegs. Monday start off on a little TT track, so we started having turns going right and left in one lap. On day one and two of the camp, we did 5 minutes then we exited the track. Once everyone was off, we went back out on the track, but the opposite way that we started. On Monday, I tried wearing a steal shoe. 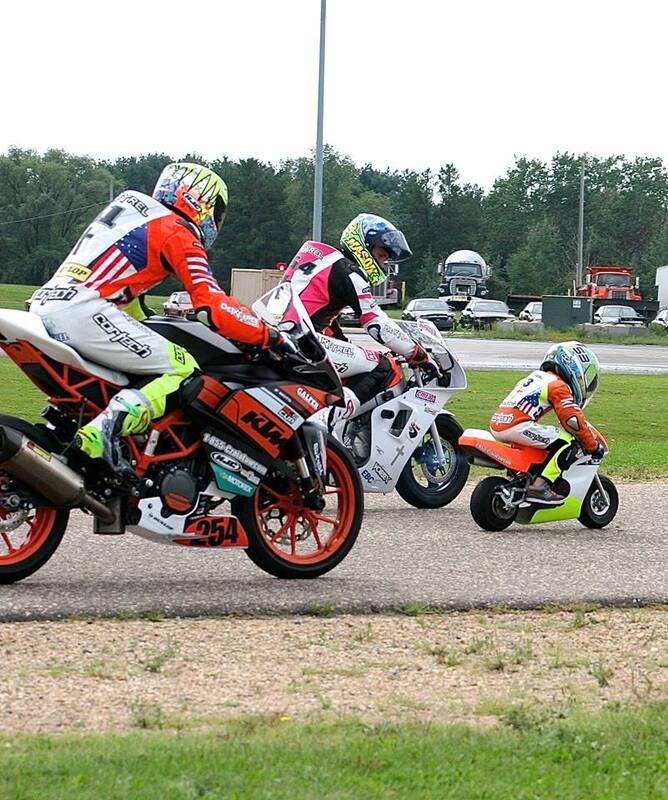 It was super fun riding the big TT track with all the instructors, Danny Walker and the KTM Cup kids. On Tuesday our flight wasn’t until 8:55, so my mom and I went to downtown Fort Collins. We walked around, looked at the cool shops and had lunch. After that, we went to a mini golf place on the way to the airport. Overall the trip to Colorado was super fun, I learned a lot of new skills to use while riding any type of motorcycle. 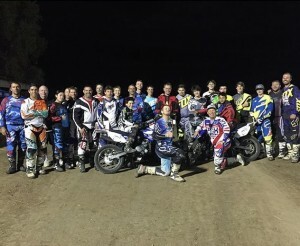 If you are looking for a school to learn to ride flat track, learn riding positioning or just looking for a fun camp to go to for motorcycles, I would recommend American Super Camp. You will have so much fun just like I did and will learn a lot. Thursday Yamaha put on an amazing dinner for all the teams that ran Yamaha’s. 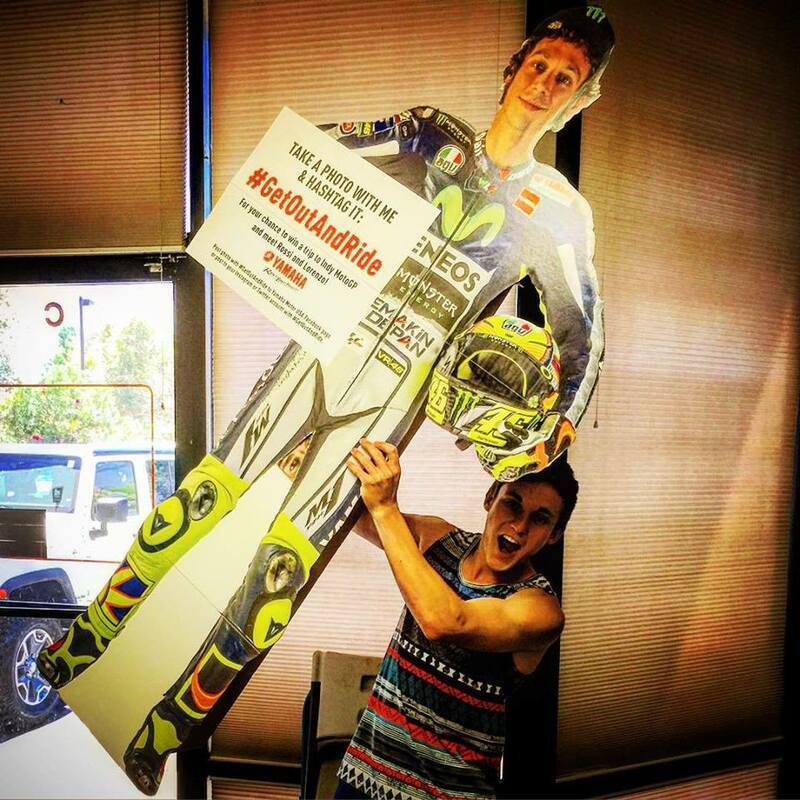 Yamaha gave joe roberts and JD beach big champion posters and big AMA Number 1 plates. 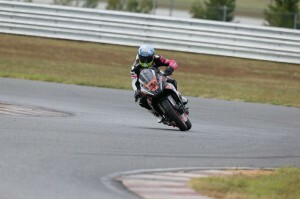 I had never ridden at NJ Motor sports park. My first few laps were super fun. Practice went great. I was dropping my times every lap. 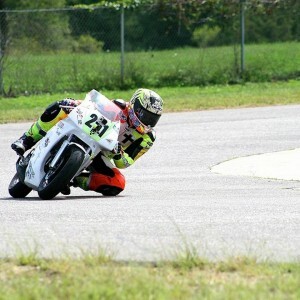 Once I started getting used to the track, getting my shift points down, and hitting my apexes, the track felt awesome. Going into the weekend, I was told this track was one of the hardest tracks to get to know and get comfortable on. I am better at learning harder tracks, so I got comfortable with this track really quickly with all the fast turns. During qualifying 1 I was running by myself for the most part, trying to time my laps where I would catch the slower riders draft right at the finish. Most of the laps it worked and I would drop some time off my lap time in Q1. I ended up 11th. After the day was done on Friday. 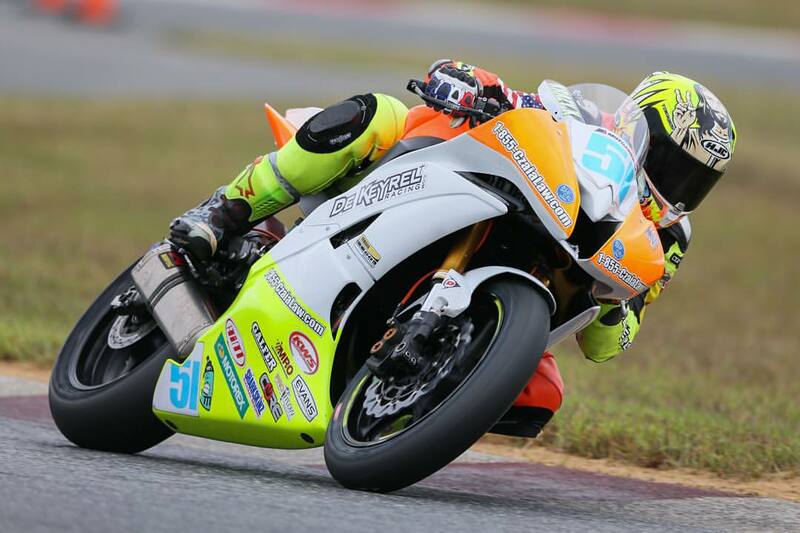 MotoAmerica put on a dinner for all the teams. Thanking them for a great first season and giving some info on 2016. 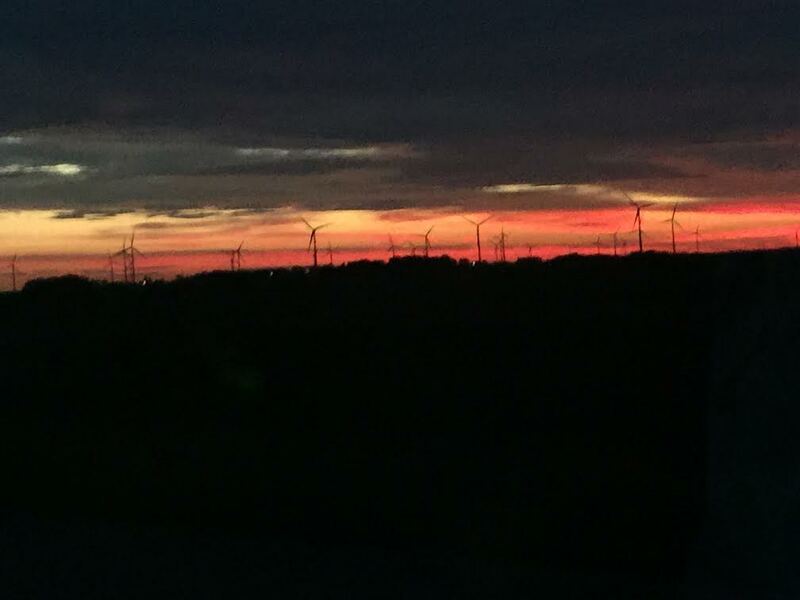 It was a great way to end the day. I started off easy running 7 seconds off the leaders pace. 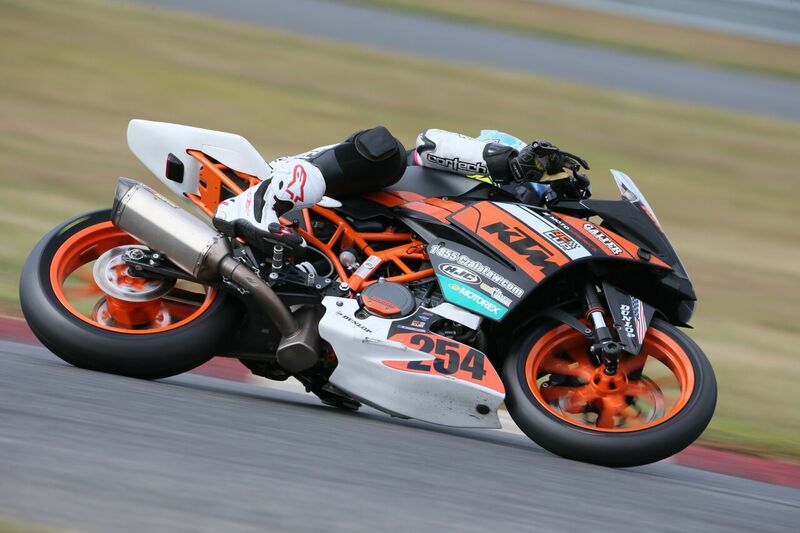 I was battling with Nick Doolan, then it got red flagged. I went back out by myself and started pushing as hard as I could knocking time off every lap. 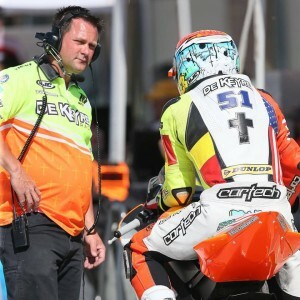 On my last lap of Q2, I was green in all sections and in turn 11 was going around the out side of a slower rider and pushed the front too hard and lost the front. After that I ended up being in 14th starting spot. I got a good jump off the line was in about 15th and just started passing people. By the end of the first lap, I was in about 13th. I passed a couple people the next lap and was sitting 11th in a group of three. I was leading the pack for about the next 5 laps pulling us towards the next rider in front of us, but the other riders in the group decided they had a faster pace. They started passing each other and slowing us down letting the rider in front of us get away. On the last lap some riders that where in front of us had some trouble and couldn’t finish. Our group got bumped up some spots and I ended tenth. I got a bad start and got bumped in turn one. 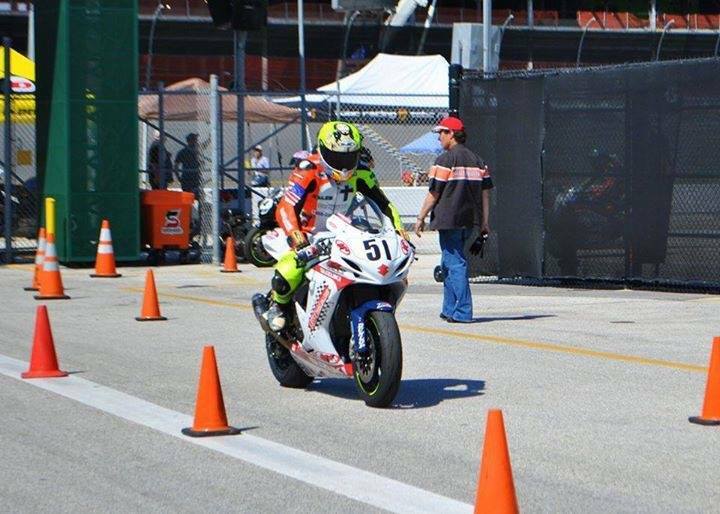 I was about 17th on the first lap and started to pass. I had moved up to about 15th and just sat there for a bit trying to think of a plan to get by the riders in front of me. That wasted my time and I made a mistake and lost some time on the guy in front of me. I had to work my way up to catch him. Another rider and I were in a good battle. At the end the race was red flagged. I’m disappointed my season ended with a finish that I think I could have done better. 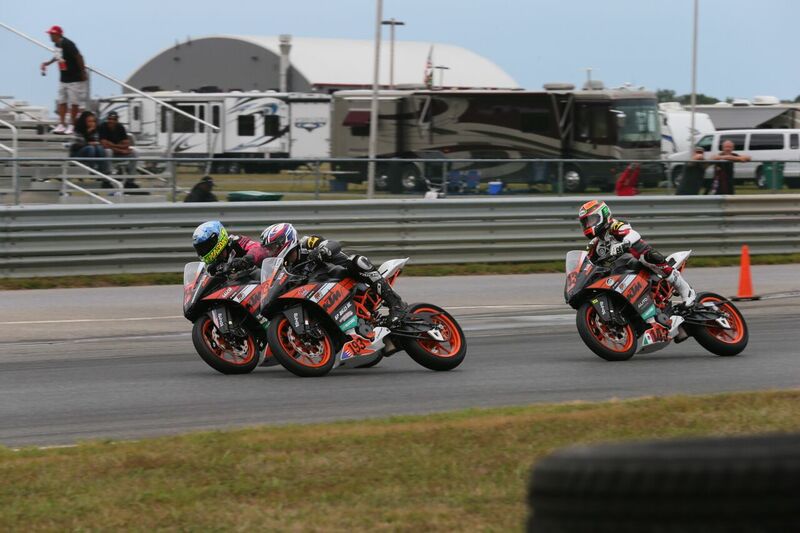 I’m just grateful to have had the opportunity to be in the KTM 390 Cup. Thank you to every one that made this year happen. The trip started out on a rough note with the trailer we barrowed blowing a bunch of tires. After a 26 hour drive we made it to New Jersey and were ready to get the weekend started! I went out for first practice and the big question was answered! 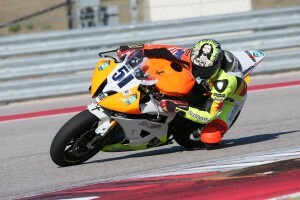 My arm was 100% and I was feeling really good on the bike! Qualifying started off with me needed a little more time on the track and just a little more time to get the bike sorted out. 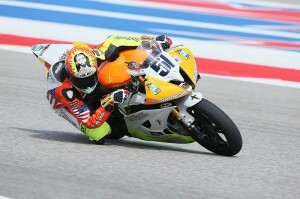 I was running better and better each time I hit the track and qualified 11th for the races. First race was another one of those dry/wet situations. I went out on the warm up lap on slicks. As soon as I started to go around the sprinkles started. At the two minute make the race was deemed wet so we made the decision to start the race rain tires. My crew had everything set to go ahead of time just in case this happened. They did an awesome job and had the tires changed with time to spare. Awesome work. I got a good jump and was right up in the mix. 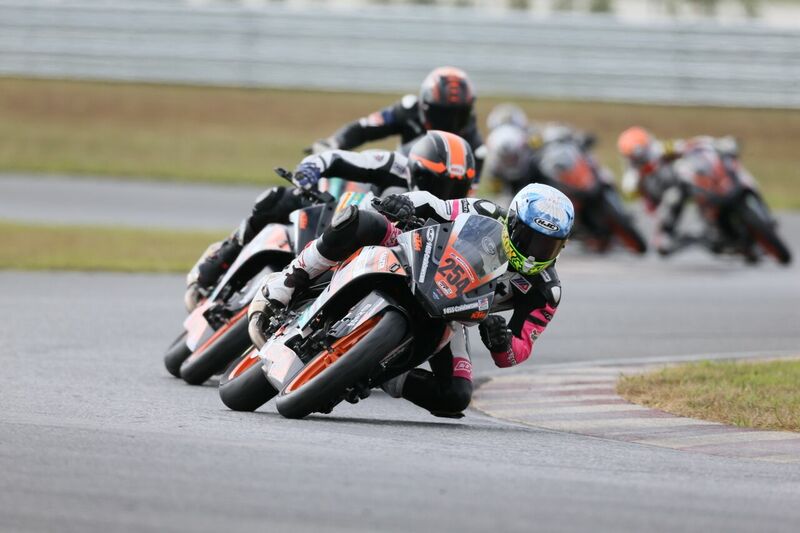 I entered into turn 1 in about 9th position with my eyes on the front. I entered into turn 5 right behind Ben Young, then we both went to hit the gas on the way out and BOOM he hit the ground. I hit the brakes in an attempt to not run him over. Luckily, I avoided him and his bike, but I had to run off track in the dirt and this put me way back. I just stayed consistent and kept pushing. I made my way up to 10th and that was all I could do. Race 2 I had an amazing start and was right up in there. I was running 10th for about 2 laps until the bike started to run on 3 cylinders again. I milked it around as long as I could, but had to pull off. 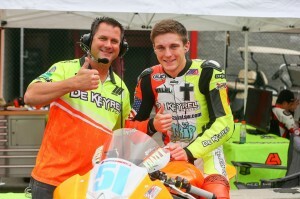 This year has been a rough one and I have to give a huge thank you to De Keyrel Racing for keeping me racing. They are 100% behind me no matter happens! I got the Green light. I have been release by the doctors on my wrist and elbow injuries. So we headed to the track to test it on the Honda NSR 50R and my brothers KTM RC390. The elbow was not in any pain or not uncomfortable to me at all! So with the info I have right now and with what my body is telling me I’ll be ready to push the limits at NJ! I feel great and am going to give it my all. The Doctor said that I have done a great job being patient in letting it heal and then pushing hard in physical therapy once given approvel. Go test it out and push to win the race. Your elbow will not be holding you back. See you all at NJ! 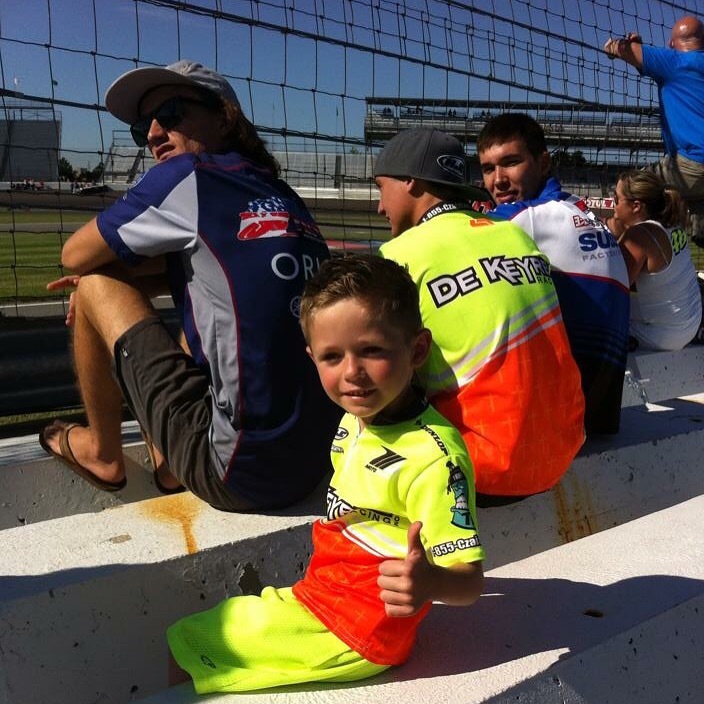 De Keyrel Racing has an amazing time at Indy! Last time I raced at the Indianapolis MotoGP was in 2010 with USGPRU. 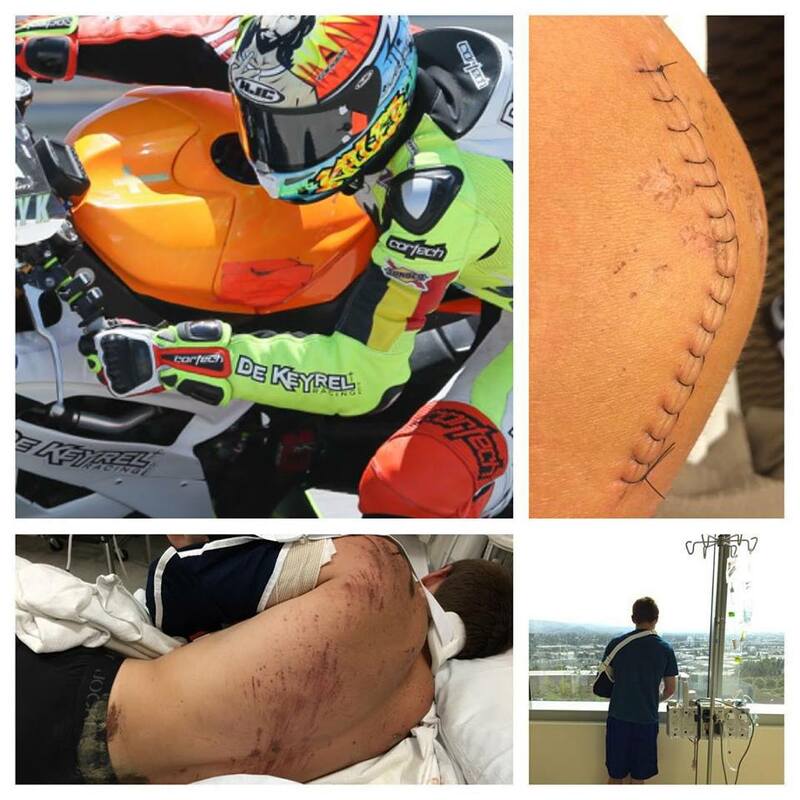 I was really looking forward to racing Indy again but unfortunately I was not going to be able to ride. I had to do what was best for my career and sit out so the bone can properly heal and I will hopefully have zero problems in the future! It was really hard to watch the race that I was suppose to be in. 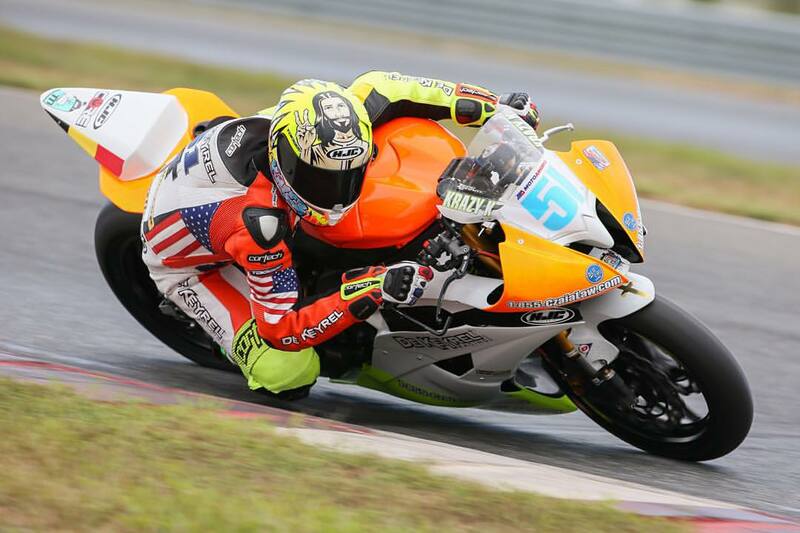 I am training really hard and pushing to be back on track for New Jersey! Other than the not racing part, both Mason and I had a great time! Hanging out with fans and signing autographs was an unbelievable time! The fans just kept coming. We got to go in a private suite and sign some posters. HJC hooked us up with some passes to go in the GP pits! Romel from HJC got us into Jorge Lorenzo and Valentino Rossi’s garage! Also checked out some of the more fan orientated activities in the pits since we weren’t racing…. 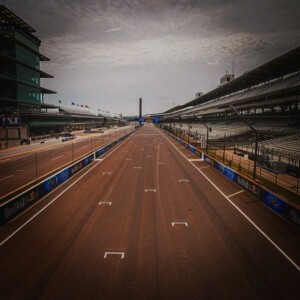 Overall I had an amazing time at the Indy GP like I do every year. It is always great to see Michelle and Joey Lopez again. Bob Fisher from Roaring Toyz even made it up from Florida this year to hang out. 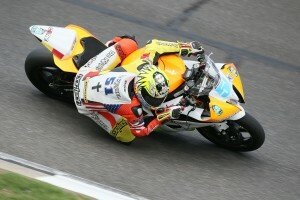 Indianapolis MotoGP is an amazing event every year and I hope they put it on for many years to come! Posted in Uncategorized	| Comments Off on De Keyrel Racing has an amazing time at Indy! 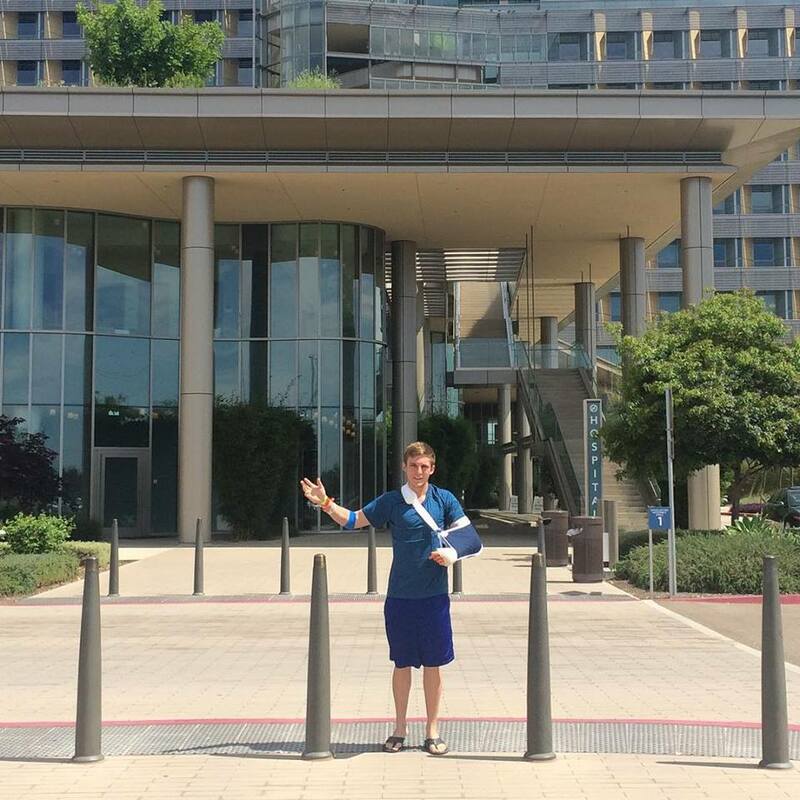 Some of you may or may not know that I broke the radial head bone of my elbow in a motocross crash training for the 7th round of the Moto America Series at Laguna Seca. 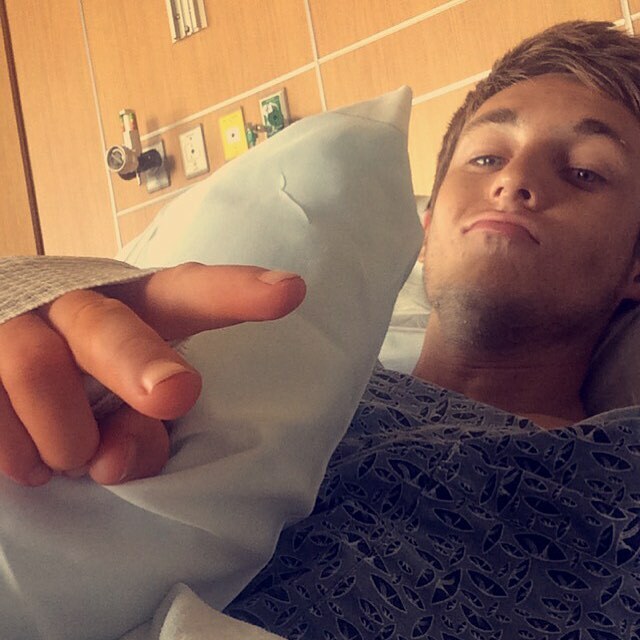 I had surgery in CA. to fix the injury to my elbow. 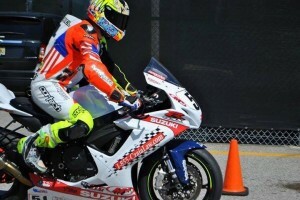 I rode practice and qualifying 2 at Laguna. I was trying to keep my time on track down and just focus on getting ready for the race. After Q2, we talked with Dr. Rossi and decided it was best not to race. 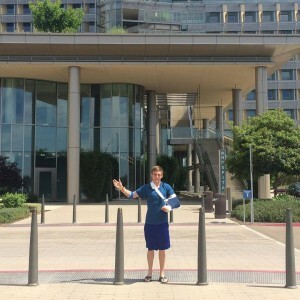 After returning home, I scheduled an appointment with Dr. McCarty. He took x-rays of my elbow and did not like what he saw. I had a CT scan last Saturday and recieved the results yesterday. 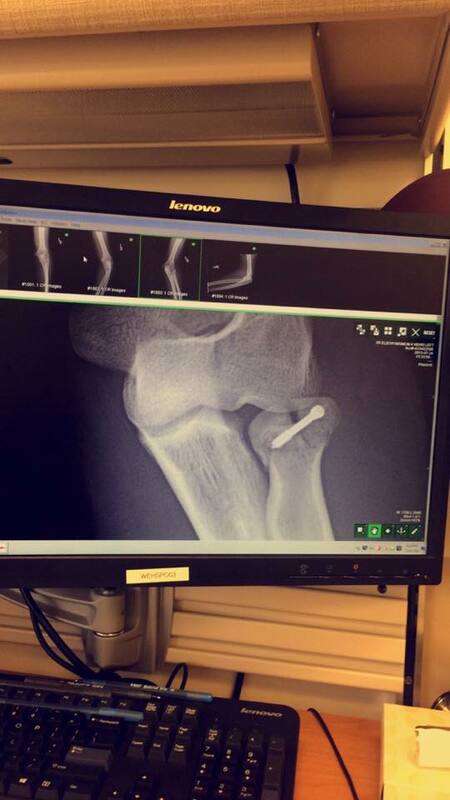 The screw from the surgery in CA is holding two of the pieces of bone together, but there are also two other broken pieces. After consulting Dr. McCarty and Dr. Bryan, we have decided that surgery is not a good option at this time. The surgery that would have to be performed would have a negative long term effect. As you all know, I obviously am physically able to fight through the pain and race at Indy. There is an extremely high chance I could destroy my elbow and never race a motorcycle again. I have decided that this one race is not worth the rest of my career. 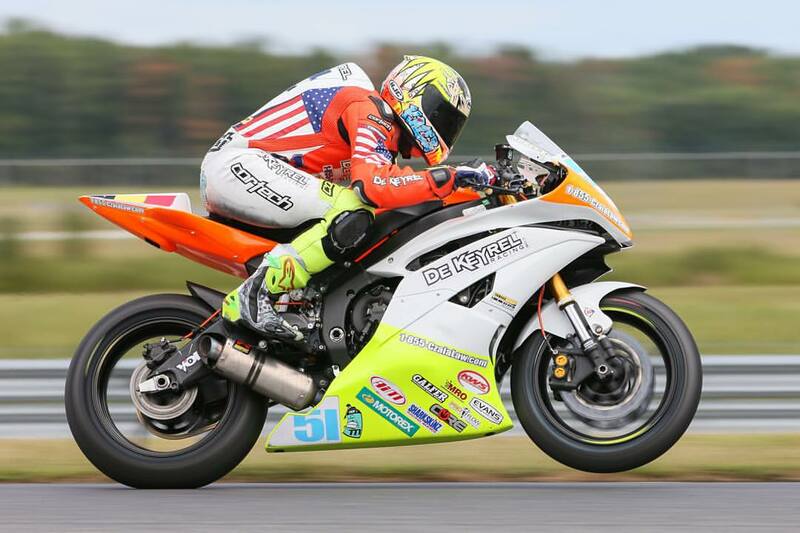 If everything goes as planned, you will see me back healed 100% for the last round of the season at New Jersey Motorsports Park. I have to give a huge thank you to all my fans and sponsors who have stuck behind me through this very difficult season. God is good! We may not understand why some things happen in our lives, but the struggles will show our true character and eventually make us stronger. If everything goes as planned, I will be riding at New Jersey and will have some very good news to share with you once we get closer to that point! Also a Thank You to Dr. Tom Bryan and Josh Hayes for the guidance and willingness to help in this situation. 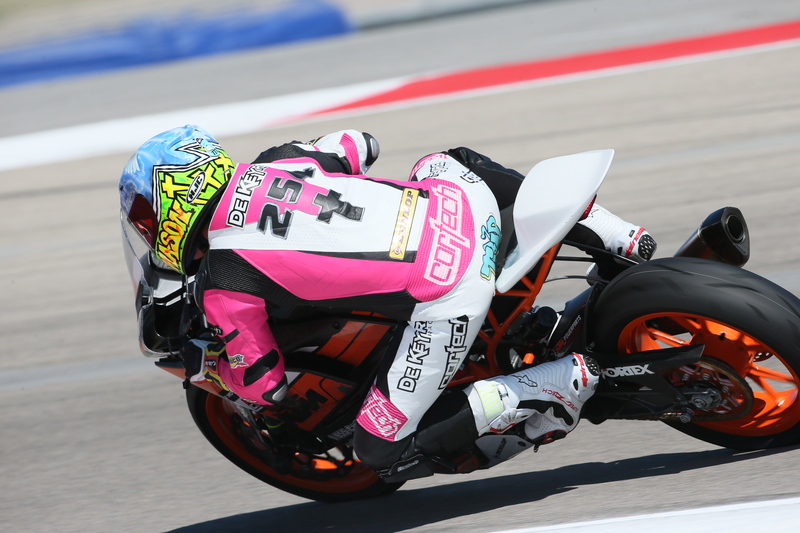 After leaving Miller Motorsports park, we started heading to Melissa Paris and Josh Haye’s house! We spent a week there and had a ton of fun! 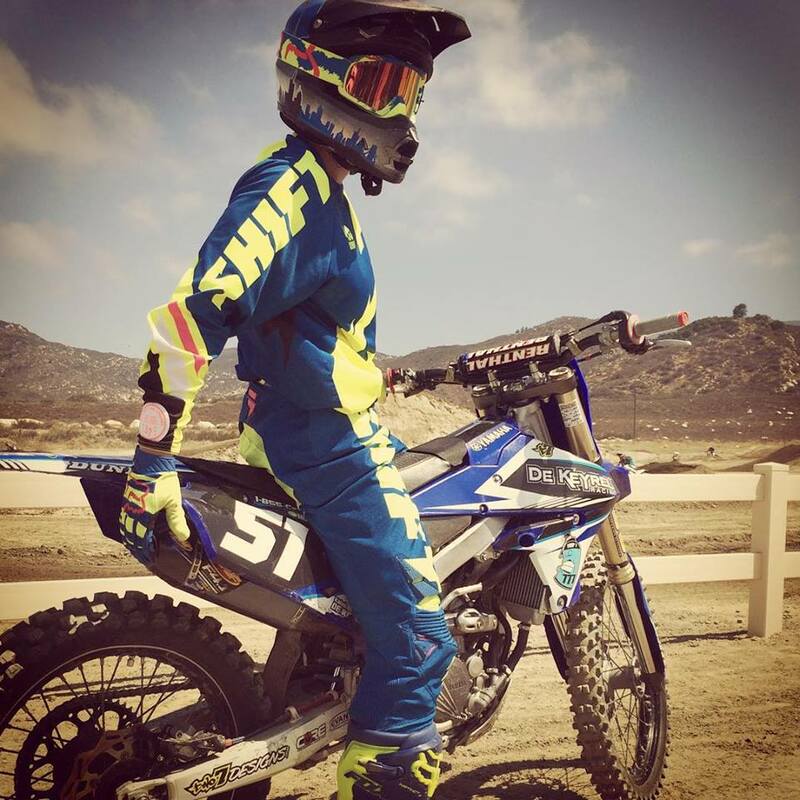 When we were staying with Josh and Melissa, we went training on motocross bikes at Cahuilla Creek MX! 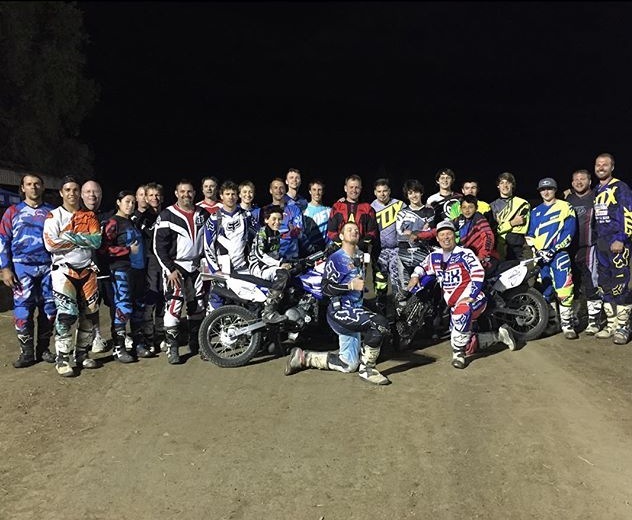 That was super fun learning new motocross tracks and getting to ride with Josh and Melissa. We met up with Tag and Zach at the Carlsbad Beach. 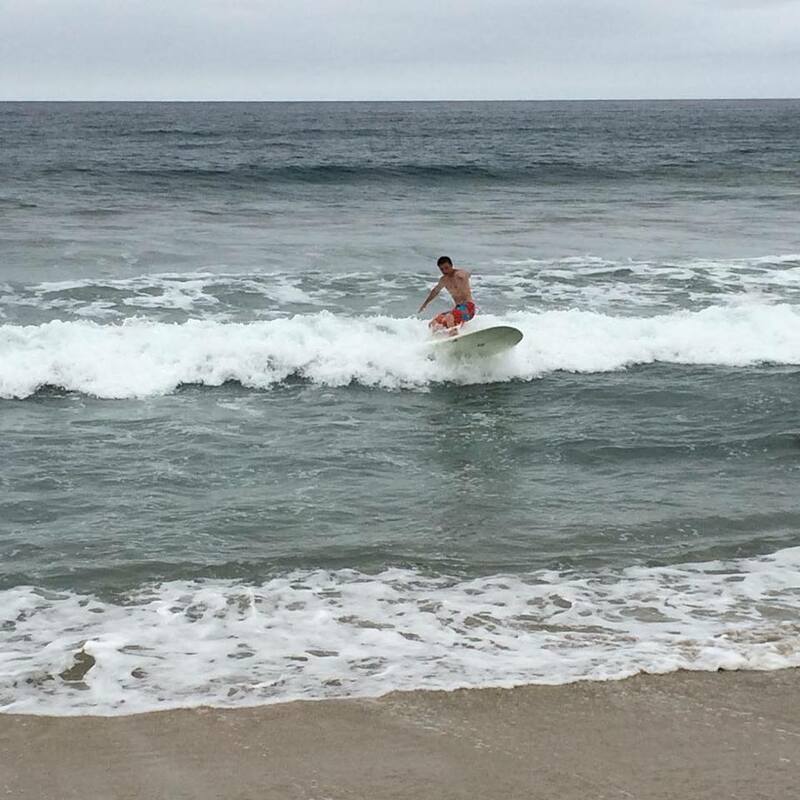 He brought some surf boards for us to try. It took me about 4 or 5 tries, before I got up. 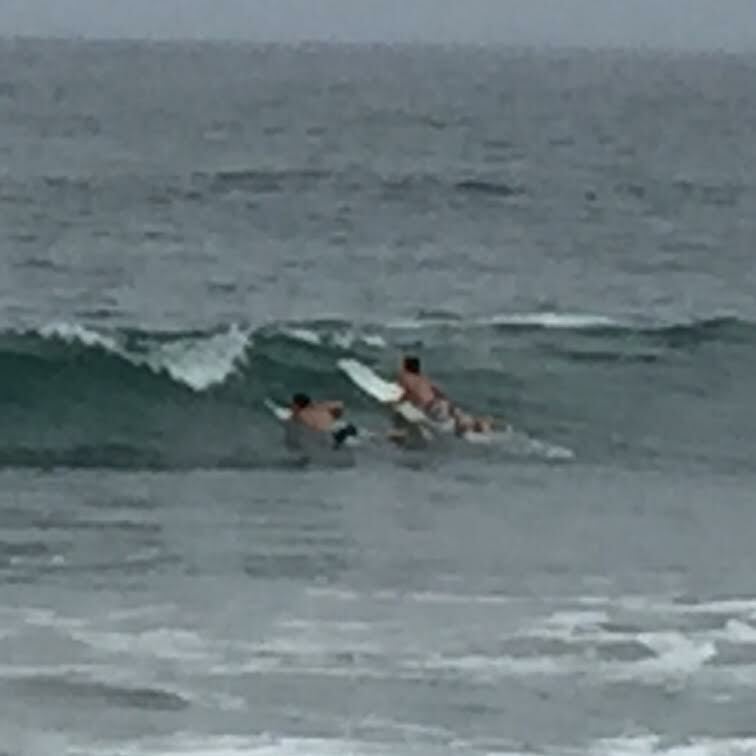 The waves were not the best, but we made do with what was thrown our way! After a couple days went by, we went motocross training again. 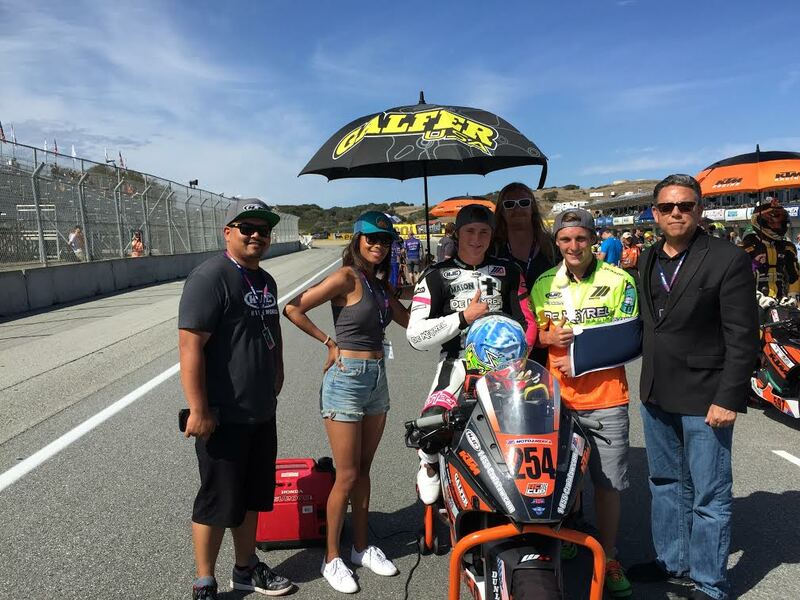 This time we went to Pala Raceway. 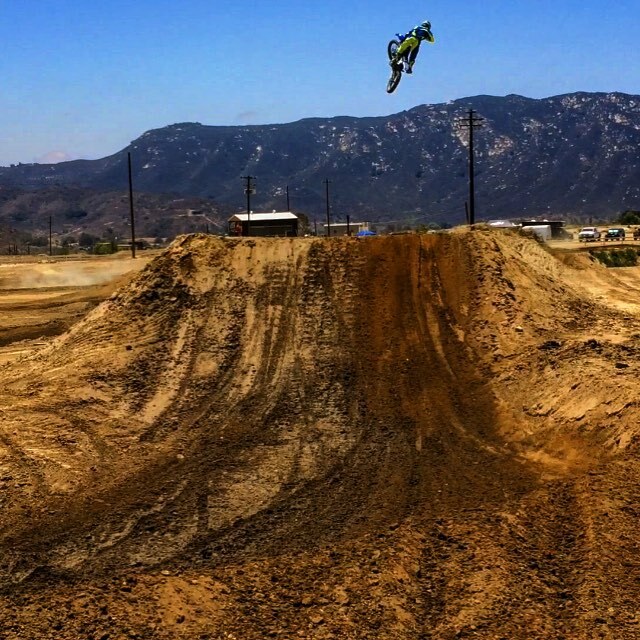 Pala has three tracks the VET track, Am track, PRO/Main. I Rode the Vet track and the Am track mainly. They were easier tracks that I was more comfortable doing! I had a super fun time riding Pala that day and was looking forward to riding there again! That weekend, we went with Josh and Melissa to their church the Rock! It was a great service and Russell Wilson was speaking about his accomplishments in football and in life and about his relationship with the Lord! He talked a lot about how there were a lot of struggles he went through getting to where he is today, but managed to get through the hard times and focus on what his dreams and goals were. 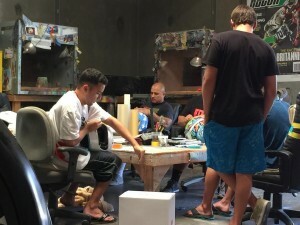 After leaving Josh and Melissa’s, we headed over to Tagger Designs shop. 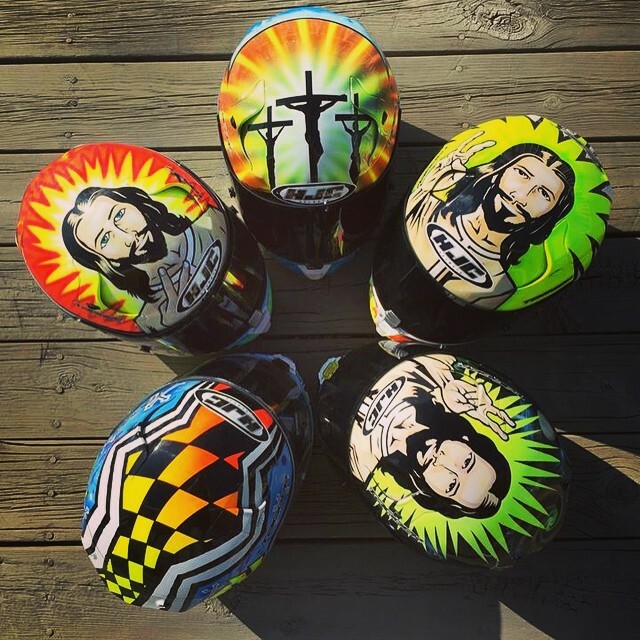 We helped prep some helmets he had sitting there for Kaleb and I! 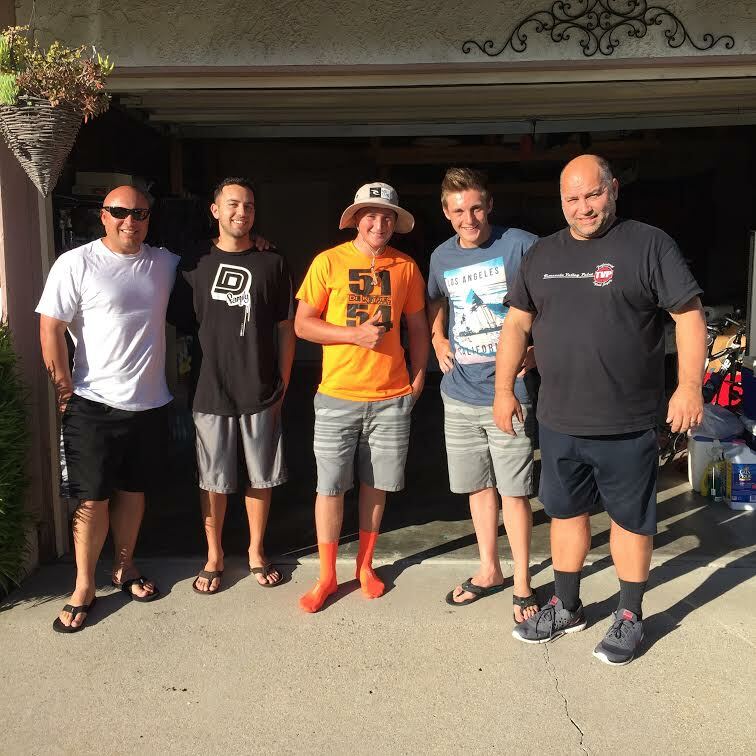 We stayed at Tag’s house for a couple days and then we went to Pala again for another training day on motocross bikes. 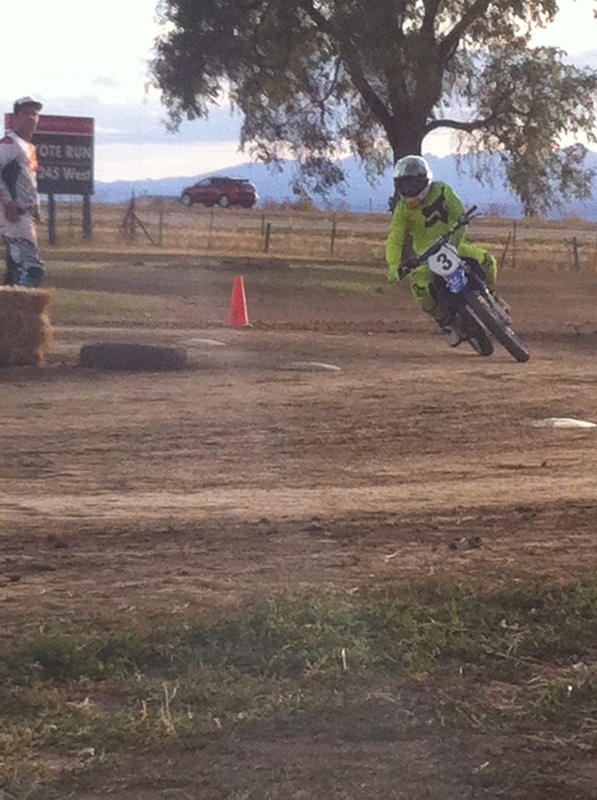 It was super cool, because there were a lot of fast pro MX riders testing. 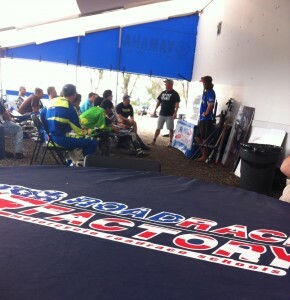 They were there getting ready for the next race in outdoor nationals in Millville, Minnesota! We had another super fun day at Pala watching the pros and being able to ride! After we left there, we went back to Tag’s house and stayed there a couple more nights. We went back to his shop in Lake Elsinore in the morning and helped prep some other helmets. We were able to see Tag do what he does! After that went back to Tag’s house, stayed there one more night. In the morning, we headed off to Pala Raceway for some more fun in the dirt! Josh Hayes, Jake Gagne and Chris Ulrich were all there training. 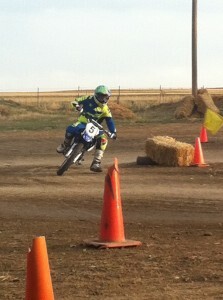 Kaleb went out for the first session on the pro track and was getting warmed up after he was done he came in. Then I got on and rode for a little bit. I went out on the amateur track and got warmed up. I came in to let Kaleb go back out. He was out there for about 20 mins, and I was thinking to myself I haven’t seen him in a while. I saw the medic in his truck going over by the big triple jump in the back, then I saw Kaleb stand up. His visor was bent way down, so I ran over. I rode the bike back and the medic took Kaleb back to the pits. Kaleb felt his elbow was hurting way too much, so my dad took him to the ER. I stayed at the track with a buddy of ours from California! 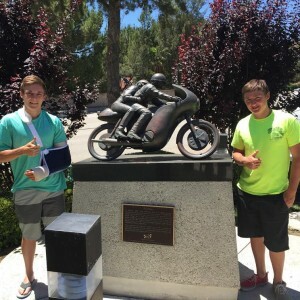 After Zach and I left Pala, we went over to Tagger’s house to play some Mx simulator and just hang out, while my dad was sitting at the hospital with Kaleb. My dad came and picked me up. We left and went to Kenny Parrish’s house. We stayed there for the night and headed to the hospital early the next morning to be with Kaleb before going into surgery! He ended up breaking a piece off the radial head of his elbow. 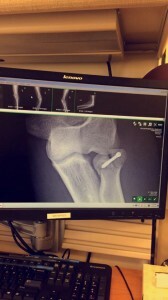 They surgically placed a screw in to secure the broken piece back on. After surgery he had to stay there one more night. 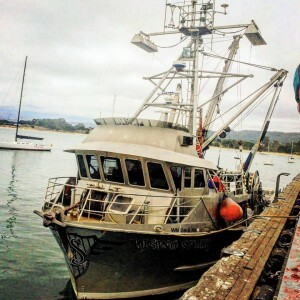 After that we started to head towards Monterey, CA. 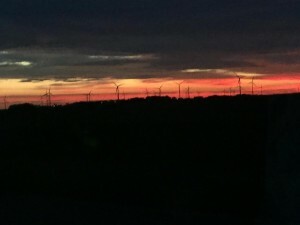 We saw some beautiful places along the way. We also got to see a lot of our sponsors buildings like Helmet house, HJC, Galfer. 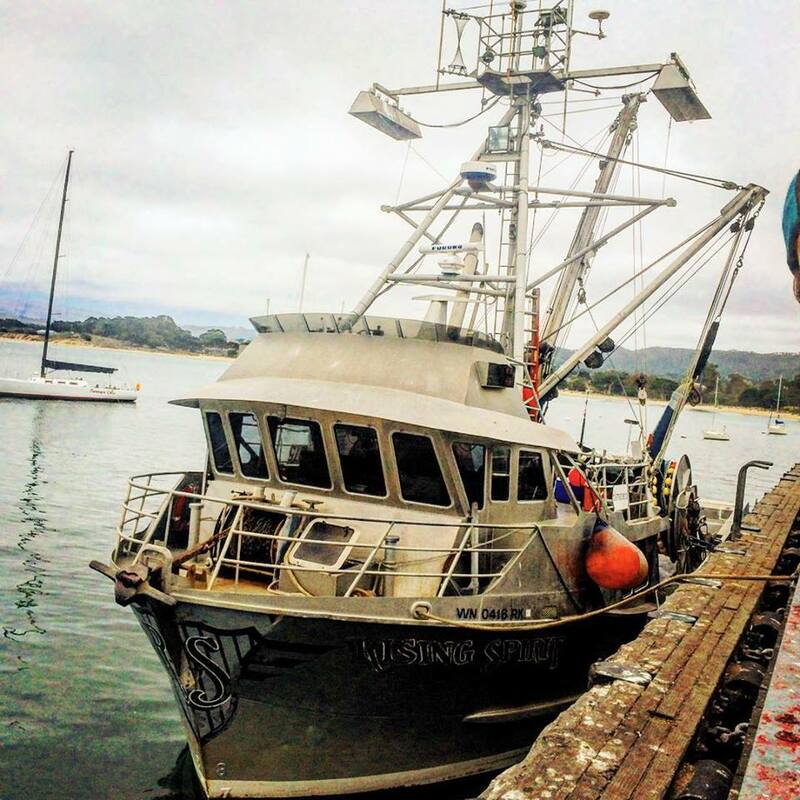 Once we got to Monterey we hung out for a day sight seeing and just looking around. 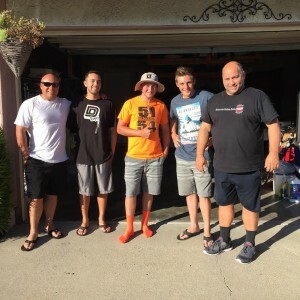 The next day we got into Laguna and started setting up our stuff and getting ready for the weekend! Practice 1, I struggled with the fog in the morning. It was kinda sketchy for me. I felt good in Q1, but my times weren’t showing it. 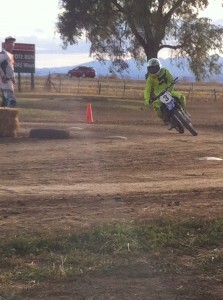 Qualifying 2, I knew I had to get my pace up, I tried pushing real hard to get one good fast lap. At the end, I ended up going faster, but so did everyone else. I had to start 19th for the race! The start of the race, I ended up about 22 in turn one. I was trying to fight my way up. Every lap I felt better and better. I past a lot of people throughout the race. In the end, I ended up 12th. Glad the riders that crashed where ok! Thank you to all my sponsors and supporters for all they do. Also got thank my team and the people who make it all happen my Dad, Mom and Brother Kaleb for all the track advise. Special thanks to my Grandpa D for all his hard work he puts in at the track! De Keyrel Racing’s month long trip! 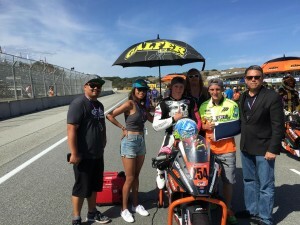 Miller to Laguna! 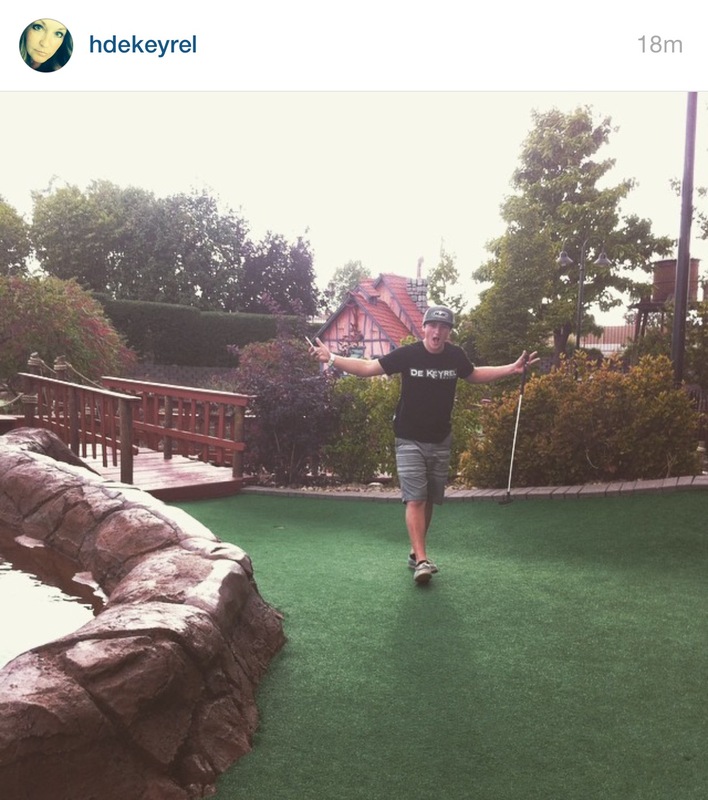 We made the 14 hour journey from Utah to Josh Hayes and Melissa Paris’s house. We were blessed with the opportunity to stay at their house for an entire week! 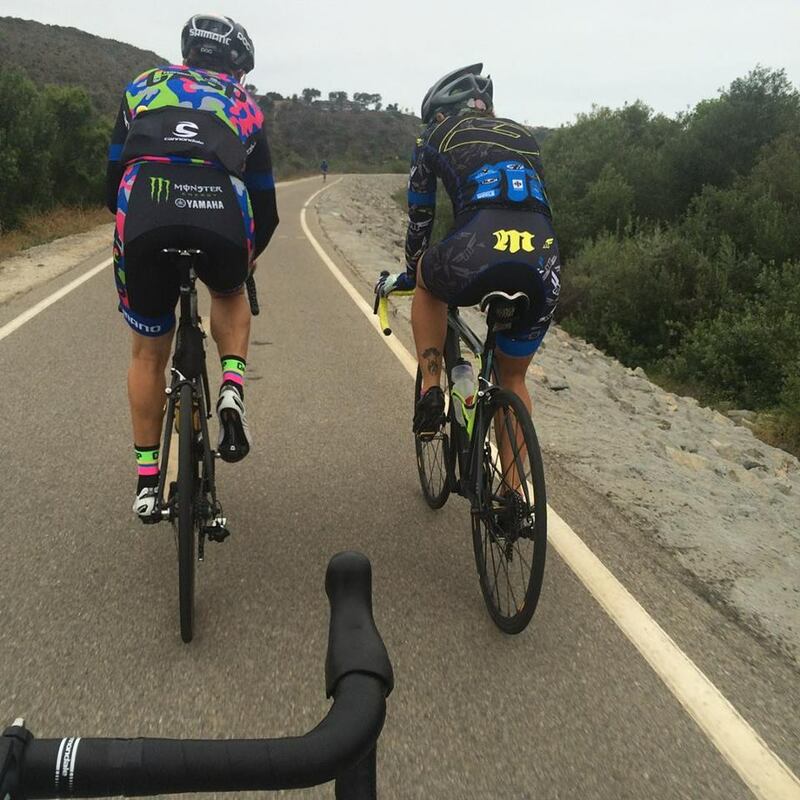 We rode motocross and road cycled every other day! It was awesome! The first track we went to was Cahuilla creek. 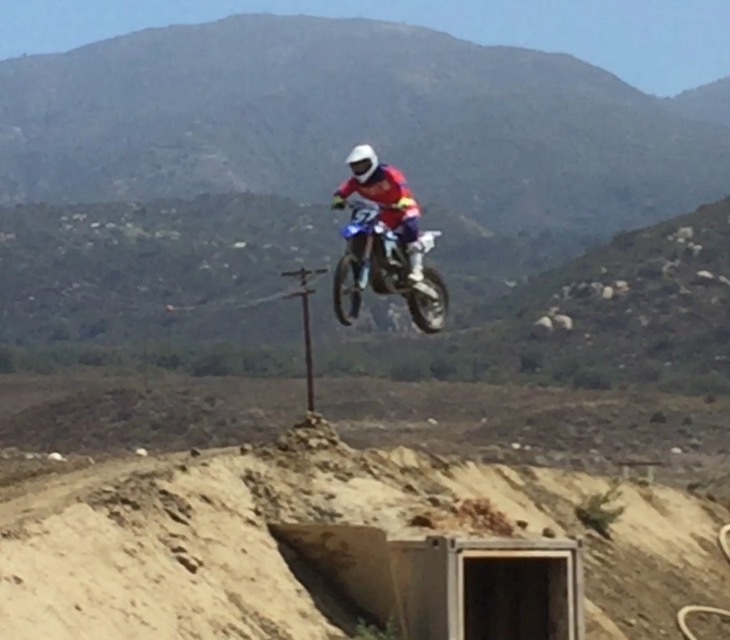 I had a ton of fun at Cahuilla and the track was mint! 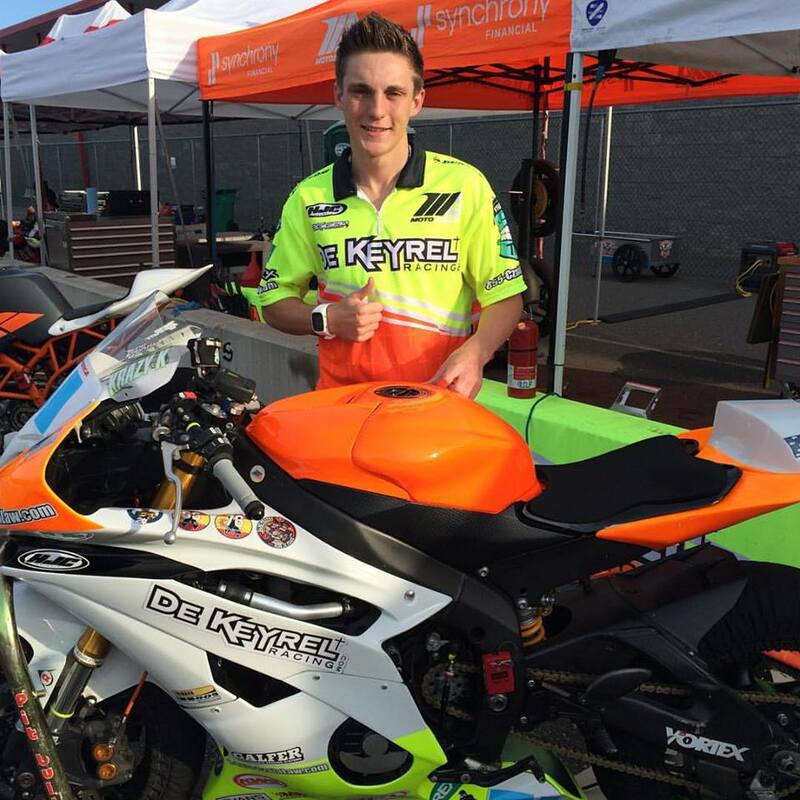 The next day we went for a spin on the road bikes, where I got the chance to talk to Josh a lot and sort of pick his brain about different things in the racing world! It was an awesome experience and Josh is a great guy with a TON of knowledge. I mean, he has been in the sport since before I was born. I figured I better listen close, because one day, I want to do what he is doing! The next day we went out and rode motocross again at Pala Raceway. I loved it! The jumps were more supercross style and just boosted you! It was so much fun that we ended up riding there 3 times while we were out there. It was awesome! There were always tons of pro motocross guys. We met up pro road racers there too. It was an amazing time and I learned a ton! 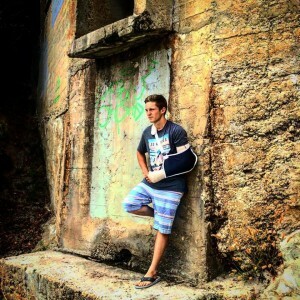 We went surfing with Tag of Tagger Designs and my new buddy Zach! 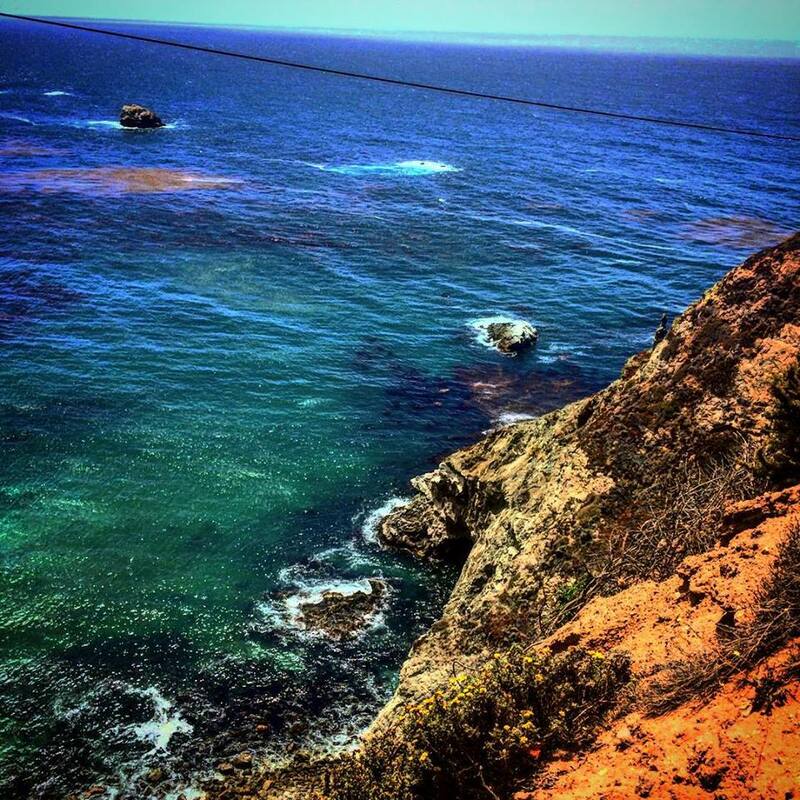 I am currently in love with the California lifestyle. 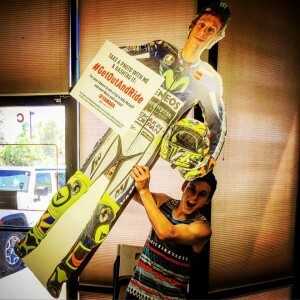 Motocross and surfing, what’s not to love! 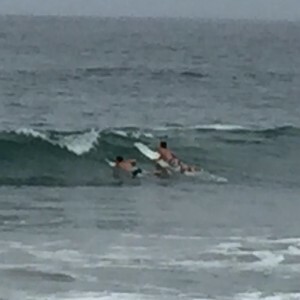 Surfing was an awesome experience for sure. If you have never done it, then you have to try it! The waves absolutely beat you down, I will tell you that. It makes it that much more gratifying when you finally get up! If and when you do get up, its so satisfying for that 15 seconds that you just want to paddle right back out and do it again! Next stop was to our friend Kenny’s house, who is our cop buddy who arrested me. If you saw that on Facebook, yes it was a joke, and no I was not arrested! 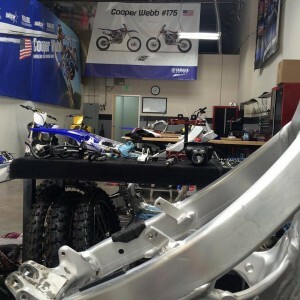 He took us on a tour of some of the pro-motocross race shops of Star yamaha and KTM. It was awesome! 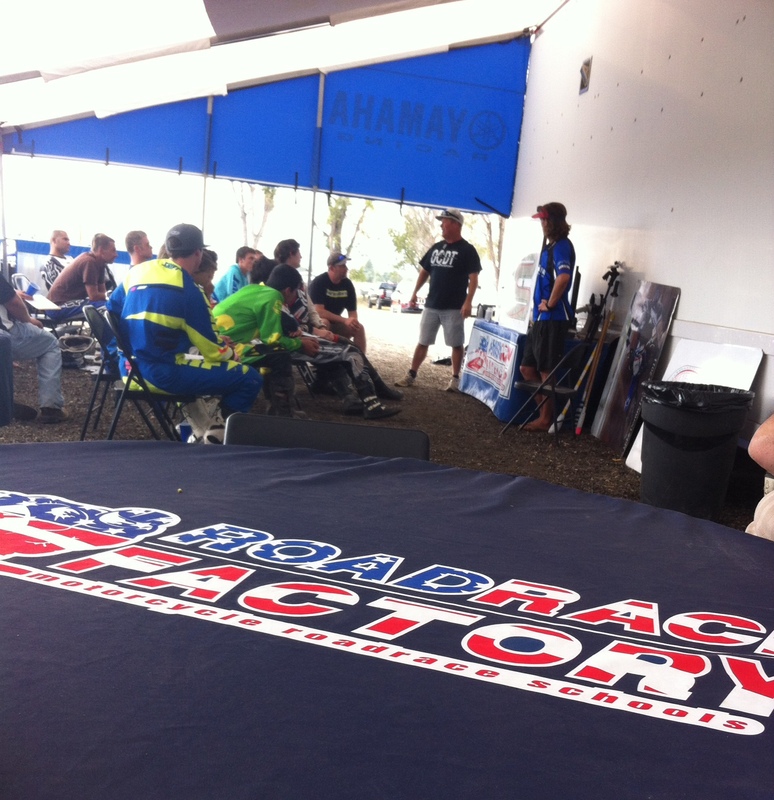 Next we also visited our friends over at Road Racing world and even did a 50 mile road bike ride with Chris Ulrich! It was fun to catch up with him and ride! 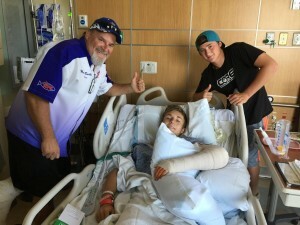 We also seen Chris at the motocross the next day where this trip goes from amazing to horribly bad. 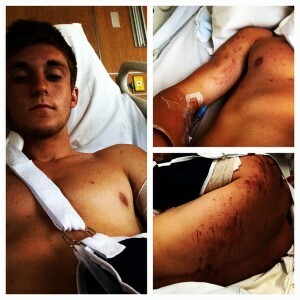 Most of you already probably knew but I broke my radial bone in my lower arm in a motocross crash jumping a huge triple. Once i finally got out of the hospital we moved on to one of my favorite parts of this trip was being able to visit all my sponsors, while we were out in CA. We started off by going to HJC and visiting their local headquarters in California. We got some insight on cool new products, also an inside look at designs, and some great features on the helmets! 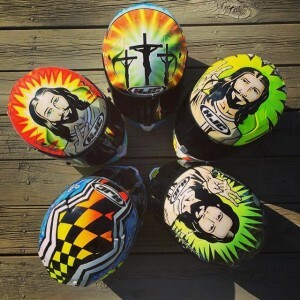 If you haven’t yet checked out the HJC RPHA 10 Carbon race helmet, I would try it on and see what you think! I’ve been wearing it for about 4 years now and absolutely love it! Next we moved onto Helmet House, who distributes Cortech Leathers. 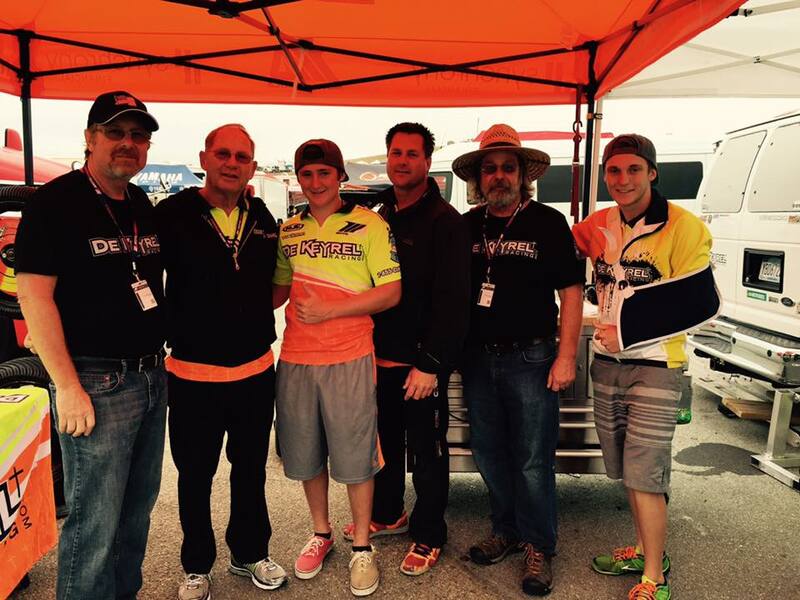 We got the grand tour by the one and only Dan Thomas, who takes care of all the Cortech race support at the track! The building there is huge! It’s so neat and clean for how big the wear house is and everything is in perfect order. The conveyor belt system that they use is super cool and really looks like it simplifies things. After the tour, we went to lunch with Dan and Mark. I had a great time getting caught up with them and can’t wait to see them both out at the track again! Galfer was the next stop on the trip and we got a tour of there building! 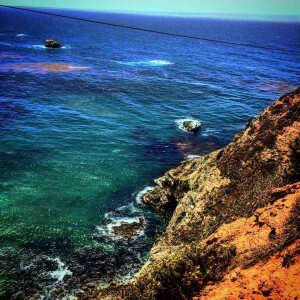 We then started the 5 hour drive right up the coast up to Laguna Seca! Once we got to Monterey we did some tourist site seeing we being we hit the track! Of course we went back to the ocean and just had some fun seeing what was around. When we got to laguna we got everything set up and I decided I was going to try to ride with my broken arm. I did three laps in practice and was having trouble down shifting. Also just the sheer force of breaking was not helping me at all. The right hand corners I felt good in but the left hand corners we hurting me and my lap time big time! 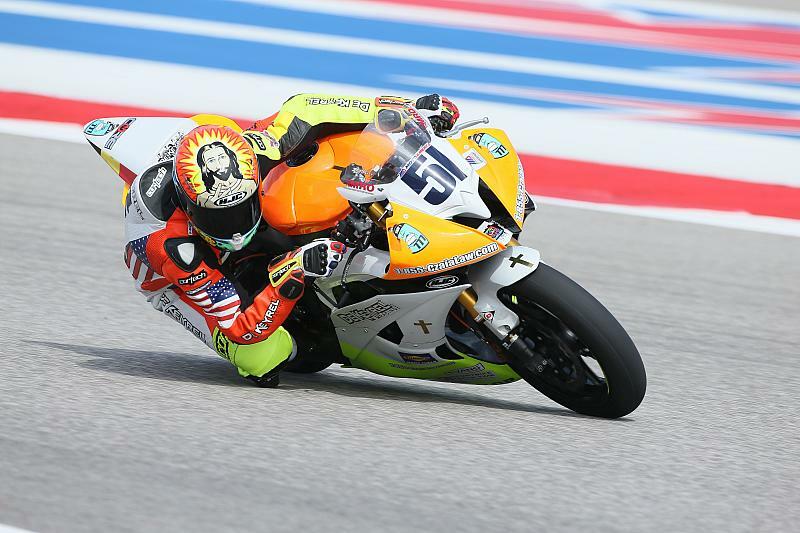 Idecided after riding qualifying and talking to Doctor Rossi that it jet wasn’t going to work and it would be better to make sure I’m 100% ready for Indy. Thank you all the De Keyrel’s and all the fans who came out to watch sorry there was much of a show. But i will be back in full force for Indy! Posted in Uncategorized	| Comments Off on De Keyrel Racing’s month long trip! 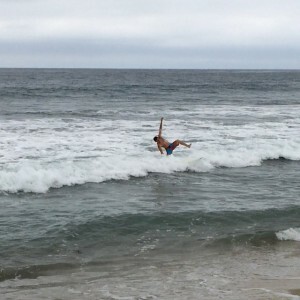 Miller to Laguna!